because someone checked on a Selden hoarder house and found 10 Huskies locked inside during the July heartwave with no food or water. 4 of these poor dogs were already DEAD. The man called for help. Brookhaven Town Shelter & the SPCA responded. The house was condemned. 2 remaining dogs went to the ER for heat exhaustion. 4 to Brookhaven Shelter. 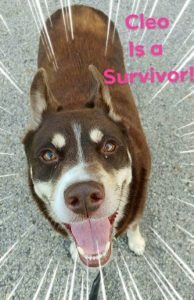 Eventually all 6 surviving dogs were at the shelter. …about the 3 Rotties dead in Shirley inside crates in a hot as hell SUV & 3 more found barely alive, while their owner slept 11 hours in his family’s air conditioned pizzeria a few hundred yards away. Meanwhile, our CLEO is about 5 years old and is quite friendly. We can learn a lot from their unconditional love. 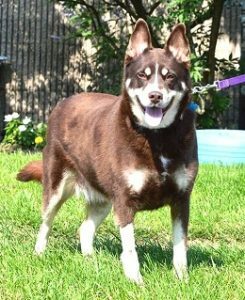 CLEO DESERVES THE BEST HUSKY HOME ON EARTH.